National Punch Day is September 20th and no, this is not when you get to take out your frustrations with the annoying people in your life by delivering a punch in the face. Instead it's a delicious excuse to drink punch! And where better to celebrate than at Punch Bowl Social in the Flats East Bank. 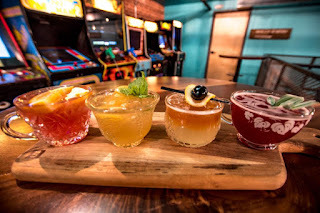 In honor of this special day, they are offering $8 Punch Flights. It's the perfect way to sample all their delicious concoctions without over-indulging. While you are there, you can play vintage video games, bowl, play ping pong and more. They are also having a 1st Anniversary Party on Sept. 25th from 7 - 9pm. Tickets are only $10 each and include a buffet, 2 drinks, open gaming and live music. If tasting All.The.Punch. inspires you to make some for your next soiree - here's a tasty recipe to try that is perfect for fall. Mix all liquids in a large bowl or pitcher. Add one whole red apple with cloves pressed into the fruit. Let the flavors mingle for at least one hour. When ready to serve, pour mixture into a punch bowl. Add ice ring or spheres. Garnish with the 2nd apple and lime, sliced thin. Use a jello mold, bundt pan or shallow bowl that is freezer proof and will fit inside your punch bowl. Fill 2/3 full of water or cider. If you want to be fancy, add some sliced apples and limes arranged decoratively in the mold. Freeze for at least 4 hours, depending on the size. When ready to use, quickly run hot water on the outside of the container to help release the ice. Or you can use these super cool ice sphere molds to make giant balls of ice. At under $10, they are a great addition to your bar. They are also perfect for cocktails because they fit nicely in the glass and don't dilute your drink. Plus you'll get style points from all your friends.